A hilarious and touching comic about polyamory, queer, and genderqueer issues. 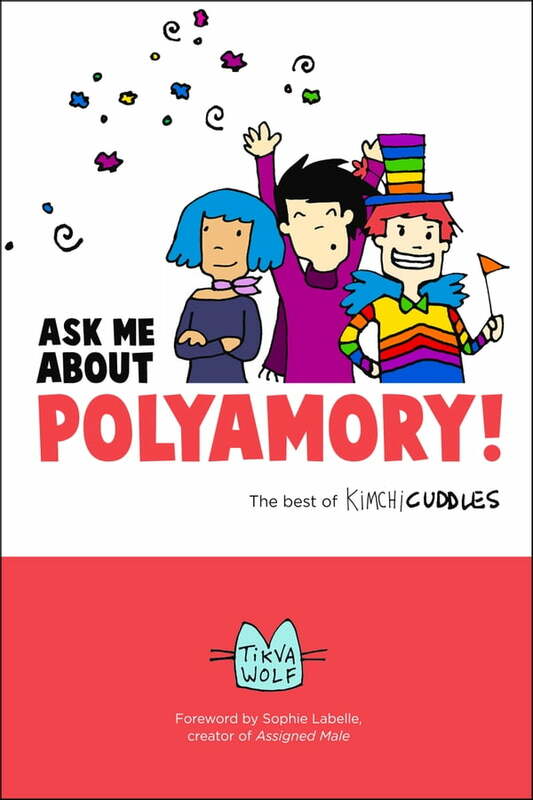 If your relationships or your gender are unconventional, you'll find useful advice and plenty of laughs in this compilation of the wildly popular webcomic Kimchi Cuddles. Quirky, endearing and charmingly (and sometimes painfully) realistic characters, many based on real people, explore polyamory, queer and genderqueer issues. Covering practical matters like time management and serious topics like discrimination, this book unites the best of two years of Kimchi Cuddles comics, organized into a practical and entertaining guide to the real world of alternative relationships. Kimchi Cuddles is a rare mix: fearlessly true to the lives of the people it depicts yet relatable enough to entertain and inform anyone (maybe even your parents). Dealing with both lighthearted and serious subject matter, it avoids clichés and easy answers, choosing instead to give examples of different schools of thought and show the humanity behind each one. Wolf's honesty and gift for clear explanation have made Kimchi Cuddles a hit with the most dedicated polyamorists as well as curious newcomers.